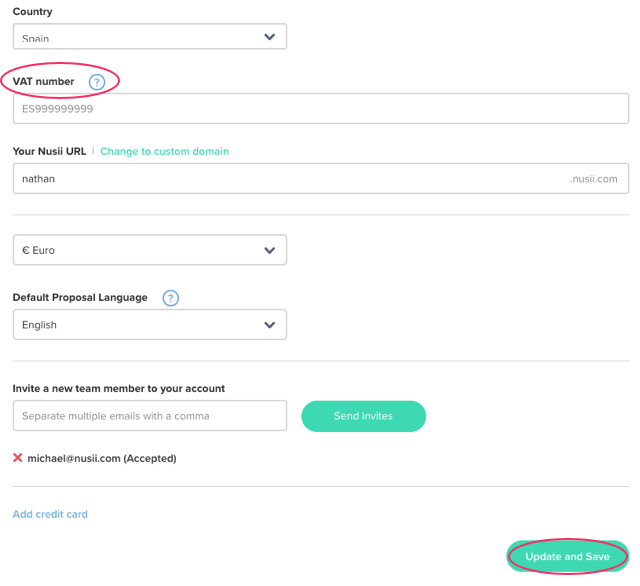 If you don't add your European VAT number during the signup process, you can do it at any point from Settings. Please note, your VAT number is used exclusively for invoicing purposes. It is not displayed on your proposal. Click Settings in the lefthand menu. It will default to your general Account settings. In Account Settings, scroll down until you see the VAT number input field. Fill out your European VAT number, making sure to put your country code before the numbers without any spaces: e.g. : GB123456789. Once done, click on the Save and Update button. Please note, only valid European VAT numbers will be accepted. Local country tax or trading codes will give an error.